Your company announces a new training program, offering financial assistance for employees to take classes. When you tell your boss that you would like to participate, he seems reluctant to give you details. It feels as if he is discouraging you from taking advantage of the new benefit. Is this a case of ageism or age discrimination? Ageism, or age discrimination, can be hard to prove, but if you know what to look for, you can build your case on a solid foundation. 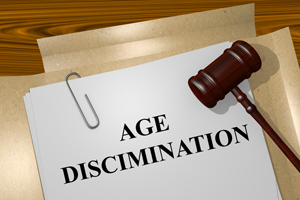 If you believe that you were denied employment, promotion or benefits due to your age, and you are at least 40 years old, you might be able to seek damages due to ageism/age discrimination in the workplace. Companies that employ 20 or more employees, government agencies and employment agencies are required to adhere to the Age Discrimination in Employment Act (ADEA). The ADEA protects workers over 40 years old from discrimination in hiring, firing, pay, job assignment, layoffs, training, benefits and promotion decisions. It also protects them from harassment and retaliation if they report age discrimination. Along with these protections, employers are also restricted in some areas when it comes to age. For instance, an employer cannot force an employee to retire at a certain age. Companies cannot set age limits for training, benefits or job descriptions. In some cases, employers might try to get around this limitation by setting a cap on the amount of experience a job candidate can have. This can occur when job postings or hiring policies specifically exclude applicants who have more than 20 years of experience. If you suspect that you have been discriminated against because of age, the first thing you need to do is to document the situation. Save emails and memos, and record examples and instances which will help you to prove that age discrimination has occurred. Be sure to diligently follow up with any applications, interviews or meetings related to the incident. Filing a charge with either the federal Equal Employment Opportunity Commission (EEOC) or the Pennsylvania Human Relations Commission (PHRC) will be the next step. You can do this through the EEOC’s or the PHRC’s website, but you must file within 180 days of when you believe the discrimination occurred. The EEOC and/or PHRC will notify your employer of the complaint and will suggest mediation. Even though mediation avoids the courtroom, it may be in your best interest to hire an attorney. An experienced attorney will be able to help you prove age was the primary factor in your case. If you feel that efforts for mediation have been unsuccessful, discuss what actions you can take with your lawyer. Contact KBG for a free consultation today.